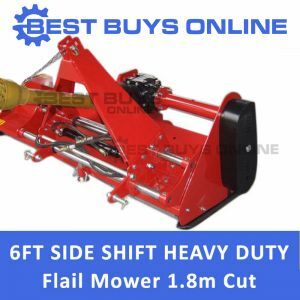 If you need a stronger and more powerful flail mower for heavy duty task that will cut through heavy grass and scrub OR pasture improvement, then this heavy duty flail mower is for you. Designed to meet Australian Standards and imported by one of Australia's most reputable companies, you'll be happy and can rely on our range of flail mowers when you shop at our store. 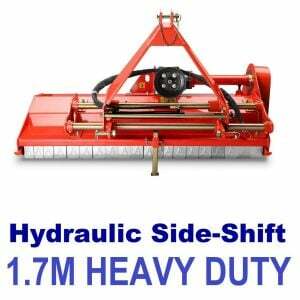 We provide large range of Medium Duty, Heavy Duty, Side-Shift Flail Mower Mulchers, Finish Mowers and Bush/ Verge Mowers. This heavy duty flail mower is designed for maintaining more rugged landscape areas including thick grass, storm debris. They are also great for mulching undergrowth and light vine mulching etc. around farms, properties, park lands and roadsides. Mulching is effective for weed and pest control and over time a mulched paddock will require less fertilisers, pesticides and herbicides. Flail Mowers are also very popular in the bush for their ability to create firebreaks and remove fuel loads to help shut down potentially deadly grass fires. Some people may use it for vegetable & passture topping or for gardening and grass land, even bush area use, capable of mowing branches with diameter of 2 cm to help shur. SAFETY: Safety flaps to prevent debris being thrown: Highly tempered steel flaps provide safety for you and your tractor against stones. They hold back objects and reduce damage to the flail mower. Best of all it will provide trouble free service for a super competitive price.